"The dear God placed me in a position in which I had a duty to call black 'black' and white 'white'." These words were spoken by Cardinal Clemens August von Galen, the bishop of the diocese of Munster in Germany from 1933 to 1946. In so doing, he risked death at the hands of the Nazis, one Gestapo leader even urging that he be publicly hanged. Joseph Goebbels and others in the Nazi leadership, knowing the bishop's popularity, advised waiting, subscribing to the adage that "revenge is a dish best served cold." 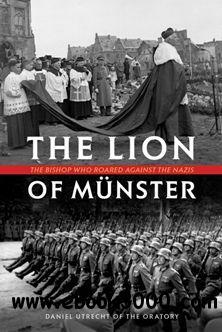 In this, the definitive English language biography of the great Lion of Munster, readers will encounter the young von Galen as he learns the Catholic faith and love of the fatherland from his family, members of the German aristocracy. A nobleman, a "prince" of his people and of his Church, the boy grew into a man, a six-and-a-half-foot tall giant of a man, who, though he loved his homeland, loved God, His Church and His law even more; for he knew that calling his homeland back to the ways of God is the one way in which a bishop can best demonstrate that love for the people under his spiritual care. And so, in three magnificent sermons and countless other speeches, communiques and gestures, the Lion roared.